It rained heavily yesterday at Ampang, which coincidentally was the day before the eve of the Nine Emperor Gods Festival. Thanks to a busy work schedule, I have not been taking photos of the various on goings at the temple for the past few days. 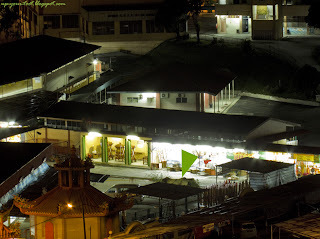 So just past midnight, I took a photo of the temple compound. All seems to be set for the Nine Emperor Gods Festival here at Ampang's Nan Tian Gong Temple. 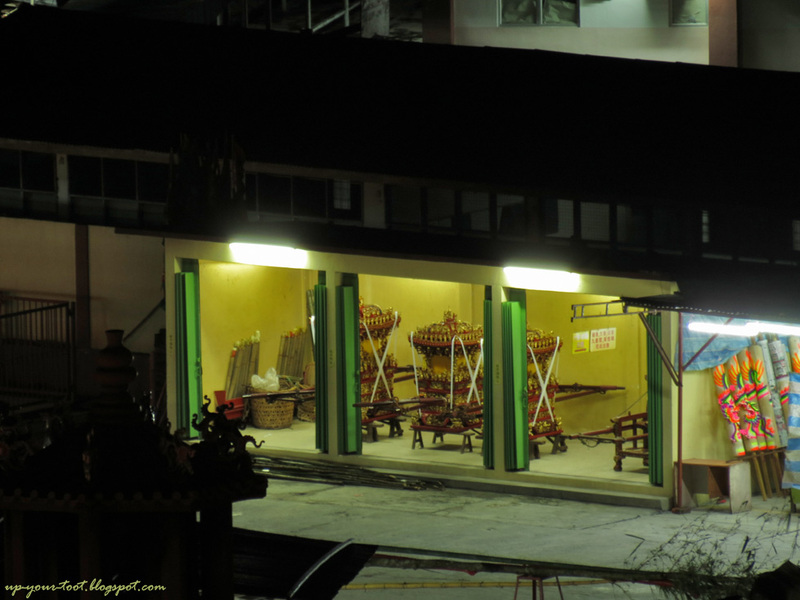 The Ampang Nan Tian Gong Temple past midnight on the 14th of October 2012. The green arrow points to the culm of bamboo that will hold the lantern. The bamboo pole for the nine lanterns is ready at this point, complete with a fresh culm of bamboo and its leaves that will be a prized possession at the end of the ceremony when the lantern pole is lowered again. The Nine Emperor God's sedan chairs are in open view, and looks set to receive the deities later this evening. So next will be the raising of the lantern pole, which technically signifies the start of the festival. The three sedan chairs for the Nine Emperor Gods. There are stacks of dragon joss-sticks at the stalls next to the 'royal garage'.